OMEGA’s PXM80 Series is a heavy duty, wet/wet, differential pressure transducer available in ranges from 0-2 to 0-350 bar. The Series is available with either of three outputs; mV/V, amplified 0-5 Vdc or 4-20 mA. These are suitable for interface with most PLCs and computer based control systems. An extremely high over pressure capacity of 100 bar or 150% of capacity (whichever is greater) make the PXM80 an extremely durable transducer. FM approved intrinsically safe rating is standard. 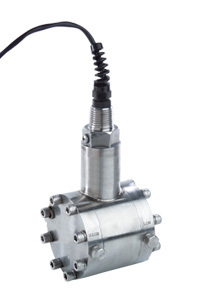 The all stainless steel construction, high over pressure protection and FM approval, make the PXM80 Series differential pressure transducers a high reliability transducer in harsh industrial environments. Output: 0-5 Vdc ±10% adj. The "To Order" Box reflects a sample of many possible configurations available in this series.